Change is inevitable. You have been hiking all alone but now there is a baby in the family. You have been wondering how to go on hikes with your baby. 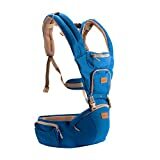 Of course- it’s not an easy decision but with the best baby carrier you are good to go for hikes with your baby. Nowadays, there are a lot of baby carriers in the market that are convenient and safe to allow you and your baby enjoy nature. 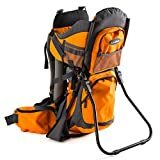 In this guide of top 10 hiking baby carrier, we will look at the best carriers in the market today. Hopefully, we will give you an insight on the best hiking carrier to purchase and explore the wonderful nature. The Kelty Journey carrier allows you and your little one to hike safely on the trail. The 5 point child harness keeps your baby safely tucked at the back. Kelty Journey carrier has an easy to adjust suspension system that assures it’s a perfect fit for parents. The leg secure strap and a five points harness keep the little one nestled comfortable and in place. The seat is comfortable, height adjustable with padded child’s seat that comes with a sun hood to protect the baby from harmful sun rays. The waist belt slides to a perfect length adjustment and fits a torso of 38-48 cm, 15’’-19’’. The auto deploy kickstand which is patented and has no pinch hinges offers a safe platform for unloading and loading your child. The convenience and comfort features comes from the storage under the seat, the chin pad is removable, it has a front side storage pocket and it is hydration compatible. The 5 point harness keeps your baby safe on your back as you trek. It is great way for both the mother and the baby to bond and you both fuel the outdoor love. The removable sunshades and padded shoulders enable the parent to carry the baby feeling comfortable. 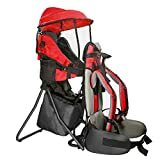 The hiking backpack carrier is a product with thoughtful design, environmental thought and attractive games tools and toys to keep your baby happy. It is an ideal carrier for a busy parent who loves to show their baby the outdoors. The baby carrier is lightweight with a rigid metal frame that evenly distributes weight of up to 40lbs. The waist belts snug and sturdy sizes of between 27-48. 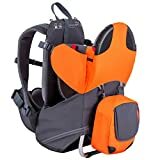 However it comes with multiple adjustments options for strap shoulder to fit well on the shoulders and give you a good posture for hiking with your baby. It comes with a convenient FDA an approved hydration pouch for streamlined storing solutions. Additionally, it is light weight, the duffle bag is large to assist in storing baby essentials as well as air travel fit. The storage main compartment offers a large space for all you baby hiking needs, the pouch is insulated for short term storage as you hike. It works well with kids as young as 6 months –you require head support to 4 years. The recommended weight for the carrier is 15-40 lbs. as the baby sits comfortably inside the 4 points adjustable harness, seats are padded that adjust to the height of your baby. The baby’s shoulder are snuggly hugged with the tall protective side cushions and with soft padded pillow head. When the baby is not enjoying the hike they will be snoozing safely and comfortable. The back pack is tested for lead, usability and fire risk for perfect outdoor experience. It is cuddly and soft when the baby needs to nap and still comfortable when they are peering on the parents shoulders. It is made of padded shoulders and therefore the parent shoulders hardly get weary when hiking on expansive terrain. Fresh shines baby carrier is made of 100 percent polyester, 100% polyurethane and fits a baby of 13-44 lbs. It is made to give you diverse carrying options. It has four baby carrying positions the carrying when the baby face is out, back carrying and the hip and also the baby face in when carried on the front side. The hip side carrying can be used alone. It has an airflow panel and a sleeping hood that helps to block sin rays when the baby is sleeping. It is also hided into a pocket to keep baby in full sight. The front pocket can be opened to allow airflow and keep baby cool. It has large adjustable waists belts with convenient pockets to store mobile, keys, cards and baby bottle. The waist belt is padded and distributes weight evenly between the parents back and shoulders. It is machine washable making it easy to clean. Wipe daily for good baby care, remove inner support before cleaning. It is both machine and hand washable. It has 4 different carrying options: the baby face out on the front carrying is ideal for at least 6 months baby, the baby face out which is the front carrying is ideal for four to 5 months old baby and back carrying is perfect for 8 months to 2 years baby. The four option is the hip carrier which can also be separated into a one single seat and it is convenient when travelling. Aluminum frames makes this carrier lightweight and provides a stable platform for the bay. The torso is adjustable to a 6 inch /15 cm and can be ideal for babies of up to 4 years. The adjustable halo double harness and the baby seat if surrounded by a framed, a padded cockpits for comfort and security. Built in sunshade retracts quickly from the zipped pocket to protect your baby. The fits on the fly hip seat belt is adjustable to 5 inches that is 13 cm of an extension on the both sides for a custom comfortable ventilated fit and support. Frame is made of aluminum making this baby carrier light weight. The parents shoulder are taken care of in this product for the long haul. The 2 reinforced grab handles allows secure pickup when the baby carrier is placed down and the base is wide with a locking footing bar for stability. It has a built in sunshade. Good for protecting your baby from harmful sun’s rays. You carry the baby diapers with the availability of the zipped compartment at the lower side. All the baby essential are important when you are hiking. The loop cord makes this carrier a fun to be with. There is a toy attachment loop that has baby’s toys fir extra fun. Introduce your little baby to the wonders of the nature with ease and comfort with the Deuter comfort carrier. Well designed for the boundless freedom feeling on longer hikes. The soft and large soft chin pads, adjustable height seat, various compartments and pockets for baby and parent this is the ideal package. Ideal for kids weighing 16 to 40 pounds who can even sit by themselves. Features a wide kickstand for stability when you offload. It has a2 gran handles that makes it easy to lift your baby without any assistance. The carrier has ample storage areas and compartments. It has maximum ventilation which is a notable feature with the Deuters innovation which delivers body hugging carriers with unmatched breathability. This helps the air to circulate and keep moisture away from the kid. The carrier is comfortable for parents and baby. The chin pad is soft which provides maximum support and comfort for the baby to nap and rest. The frame is aluminum making this carrier lightweight. It has a fully adjustable vari-fit system that the parent uses to adjust the carrier to their back. Good for swapping between mum and dad without removing baby from carrier. Hip wings are pivot shaped for steep and uneven terrain. The straps are adjustable for stability and optimal; load transfers. The footrest helps to keep the baby legs safe and comfortable as well as warm. The carrier is JPMA certified for child safety standards. All Deuter carriers are thoroughly tested and are suitable for baby’s who are bale to sit upright and can maintain head controlled by themselves. Seat are adjustable.to the desired height of the baby. The seat size varies with the adjustable length. This promotes a perfect sitting position for the baby to enjoy nature sightseeing. The load capacity is 48 pounds maximum. Deluxe baby carrier is made of metal frame that is lightweight weighing only 5 pound. Suitable for daily use without getting tired of hiking with the baby. It comes with multiple pockets, wait straps are padded and storage compartment for the parents and the baby to carry essential stuff. The metal frame is foldable to flat for east carrying when travelling. The 2 side’s water bottle holders, extra-large back pockets to store diapers and necessities. Ideal for baby’s between 6 months to four years. Features a kickstand that stand upright when placed down. The protective canopy is easily removed in case of rain or slight showers. Aluminum frame makes this carrier lightweight and durable. Retractable and easily removable canopy for suns protection. The straps are padded and the hip belt has energy absorbing lumbar that keeps the baby secure, cool and safe. The canopy is a great advantage for protecting the bay when the sun is hot. Multiple pockets enable the parent to carry enough baby essential. Padded shoulder and an adjustable system provide comfort for your baby. Metal stands are quickly foldable when on the do and can stand upright on a flat surface. A premium baby back pack is the perfect outdoor gift for your baby. Your active hiking life should not stop with the arrival of the baby. That is why the Premium backpack for baby is designed with superior unique features for parent and baby. The carrier has multiple compartments that are zipped with mesh pockets to carry food, diapers and wipes. There is an added hip pocket to keep handy stuffs like keys, phones without keeping the load down. The safely padded cocoon with safety stirrups and straps allow the parent to carry the baby safely and comfortable. The baby carrier has removable storable sun visors that protect the baby from sun elements. The baby carrier is height adjustable with heavily padded straps and the waist belt is load bearing to spread the weigh from the back to the shoulders. It features multiple compartment and pockets and an insulated pocket for the bottle. The pockets are mesh design and a large pocked at the back of the carrier. The diaper changing pad is a plus. The foldable diaper pad allows the parent to change the diaper in a clean and safe surface when on outdoor environment. The Premium baby carrier is made of super-premium material that is waterproof and with aluminum making it lightweight. The diaper changing pad is one of the advantageous feature for this carrier. The changing pad provides a clean surface for diapers change when you are on adventure. The pad folds neatly afterwards. The food zipper is thermal insulated to keep your food and the baby’s warm at the desired temperatures for long hours. You need not to worry anymore of feeding the baby cold food here is the solution. The premium baby carrier lets you to unending adventure with your baby while you introduce great outdoor fun. The carrier gives the parent the freedom to roam. A baby hiking carrier is the great deal that is designed for outdoor adventures. The baby carrier is comfortable with padded straps that keeps you feeling comfortable and create memories that will last a lifetime. Made of aluminum making the carrier strong and lightweight. The straps are padded and the back pack has removable sun visor that protect the precious one from the suns elements. The parent back is protected. The baby carrier is height adjustable to allow you carry the baby for long hours. The diaper changing pad helps the parent to change the diaper in a safe and clean area. The diaper pad is foldable after use. This hiking baby carrier comes with multiple compartments and pockets for carrying the baby’s essentials and food. The zipped compartment is thermal regulated keeping the toddler’s food at required temperature. The Premium hiking baby carrier is made of 100 polyester and aluminum for durability. The mesh hood. Protect the baby from the sun’s rays and glare. There is zero back strain: Perfectly designed to carry the precious cargo for long hours. The weight is evenly distributed from the back to the shoulders effectively. Adjustable stirrups keep the baby small feet safe and secure. Phil and Eds is a compact and cute baby hiking carrier enough to carry babies of up to 40lbs. 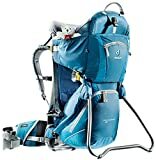 Rich with unique modern features like the supportive baby cockpit, ego fit harness, and ventilated air tech backs all come together to give parents an all functional hiking baby carrier. The aluminum frame that is internal gives the baby carrier stability when loading. Light weight and compact weighing 4.4 lbs. but can carry babies of up to 40lbs. The internal aluminum frames give the carrier free standing on a flat surface while you load. 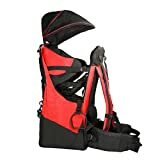 The ego harness and easily adjustable for the parent and the baby for secure fitting of different heights. The material is tough, washable, waterproof and made of high grade fabric. The straps are padded and the hip belt is easy to wear and adjust. Comes with molded air ventilation perfect for hot days. The mini back pack which is removable is an extra advantage for the carrier. Comes with a detachable mini back pack for the little one to match with the carrier. The compact easy to go makes the carrier easy to carry, compact and suitable to airlines easy to carry requirements. The molded mesh at the back allow air to circulate and keep the bay warm. The parade has child and parent adjustable harness for secure fit for parents with different heights. Apart from hiking, you can use the carrier for day trips and market errands. This cross country baby carrier is made for long trekking hours. Made with aluminum frame, it is lightweight and can withstand daily use elements. Multiple pockets is always an n advantage to the parent and the baby as they will carry enough essentials for the hike. The back pocket is extra-large for baby necessities and diapers. The rain and sun canopy is easy to remove at any time. The shoulder are thickly padded for comfort and energy absorbing lumbar pad to feel secure. Multiple pockets for storage of parent and child essentials and 2 water bottle holders. The metal frame is foldable and the canopy is easily removed. Aluminum frame weighs only 5.1 lbs. that is durable and lightweight. Retractable canopy to shield the precious baby from the suns elements and slight showers is any. Only weighs 5 pounds, metal is easy to fold flat for portability and easy storage. Multiple pockets including 2 water bottle holders is a great advantage. The kickstand enables the carrier stand on flat surface. The editor’s choice for the ideal, modern baby hiking carrier is the premium baby back pack. Reason? The diaper changing pad which provides a clean surface for diaper changing while on adventures. The thermal insulated zipped pocket also helps to keep the baby’s food with required temperature. You have been an active person and you want to pass the outdoor love to your baby. Introduce to your baby sights and sounds they have never seen before cumulated with fresh air. The best way to carry your baby around and create even more bonding time is to have a baby hiking carrier for safety and comfort and you explore the nature. The baby hiking baby packs are designed to keep the baby and the parent comfortable and safe for many miles. So, consider having the hiking baby carrier for your baby. This stage comes and goes and it’s therefore important to have the bay explore the wonders of the nature as little as 6 months. Happy hiking!